﻿The Big LePowSki goes BIG! THE DUDE shows up 4 times in winter 2010! In the last two winters The Big LePowSki Freeride Happening was such a great success that we decided to let other freeride hotspots enjoy the fame as well. 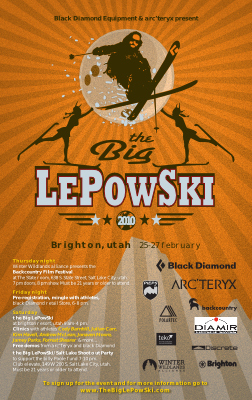 Apart from our “Homebase” Davos there will be The Big LePowSki Freeride Happenings in La Grave (France), St. Anton (Austria) and Brighton (USA). The program will be even bigger with special Women’s & Photography Workshops and more freeride courses for beginners. Our new sponsoring partner PIEPS is a perfect match for the avalanche rescue workshops that will be held on both days. Also, some of our sponsored worldclass Ski Athletes will take part at The Big LePowSki to give you an inside on the ski life of a pro rider. Description: Momentum is proud to present Pat Ament’s latest creation “Disciples of Gill.” And to celebrate, you know we HAVE to hold a bouldering comp!!! Here’s the details: The comp will begin at 4pm, with Beginner, Intermediate, Advanced, and Open categories (and of course, a raffle). Momentum Members pay $25 (which gets you a raffle ticket and a ticket to the film premier, also). All others pay $30. The film will begin at 8pm. Comp participants are free, all others pay $8. Don’t miss this film. It is one of the best you’ll see on climbing: a beautiful chronicle of the golden age of American bouldering. The film features John Gill, who indeed was/remains the greatest American boulderer. His fame has reached around the world. On the recommendation of many people, Pat Ament at last decided to digitize his original, classic 16mm footage of Gill and also his ancient footage of the amazing Jim Holloway, the only film that captures both of these two champions of bouldering when they still were in their prime. This film, central to which are these two superstars, is a priceless historical artifact. Old images come alive, restored and preserved in high definition. Pat’s vision, however, has not been simply to preserve the critical footage but also build a new film around it. His efforts have resulted in a gorgeous, nostalgic piece that remembers the golden age of bouldering and chronicles its development and central characters. Featured are all the original, most significant pioneers of bouldering and the true disciples of Gill. Barry Bates, for example, the best California boulderer in the later 1960’s, known for his exploits in Yosemite and at Pinnacles, and known also for his quiet, genial spirit, has never until now been interviewed. His lovely insights are invaluable. Also legendary Greg Lowe, the remarkable Utah master boulderer and climber, has not until now been interviewed. He and Gill sit together and muse about time and its passing. Included are commentaries by Jim Holloway himself, Rich Goldstone, a disciple of Gill’s, and Jeff Lowe. Ament also, another partner to Gill and Colorado’s best boulderer during the golden age, provides a humble portrayal of his own bouldering exploits. You are currently browsing the Utahclimbers.com blog archives for February, 2010.